I’m pretty sure I’d never seen a man wearing eyeliner, let alone one stabbing, sweating and strutting his way shirtless across a stage back lit by 16mm film of fish swimming in slow-motion. I was in the second row. Standing on my seat for two hours straight. Singing every word. Indeed, R.E.M.’s 1988 Philadelphia Spectrum performance was mind blowing enough to derail everything that had come prior, and everything that would follow. The tale is well-worn. Heck, it’s baked into my biography. That hook! 12-string Rickenbacker. Tack piano. Heavy on floor tom. Melodic, propulsive bass line. Sharp counter melody. And the lyrics: at first obtuse (“Eastern to Mountain third party call / The lines are down / The wise man built his words up on the rocks / But I’m not bound to follow suit”), and then clarion clear. “I’m sorry! I’m sorry!” Lyrics any sixteen-year-old could dig. And that was all it took. Luckily, though, Chris brought home two R.E.M. albums: “Reckoning” and “Murmur.” They were more than records, they were worlds: kudzu-covered railroad trestles, eccentric neighbors, seven Chinese brothers. It was Little America, somewhere deeper, darker, more sinister and in equal turn illuminating than my Philadelphia suburbs. It was escape. It was inspiration. It’s impossible to chronicle in any meaningful way (and against the crush of the news cycle) just how impactful Berry, Buck, Mills and Stipe were. That tour stop — the “Work Tour” (lest anyone confuse it with the frivolity of, say, Mötley Crüe) in support their 1987’s LP “Document” (the band’s first with producer Scott Litt, and last for IRS Records) was my first rock show. 10,000 Maniacs opened. I wore the t-shirt to the PSATs the next morning. “The One I Love” was the first song I learned on guitar. Its chords (EmGCD) form the basis for damn near my entire catalogue. I released a live version years later. That recording (“February 25, 2005”, a title inspired by the Uncle Tupelo record guitarist Peter Buck produced) remains my seventh most-downloaded song. A 24-hour, 1,512-mile journey to Athens, Georgia, was my first road trip. Greg Lage and I listened to “Pilgrimage” every hour. We bought a few cassettes at Wuxtry Records, snapped photos of Walter’s BBQ, and turned around. “Jefferson, I think I’m lost,” indeed. Michael was the first rock star I ever interviewed — twice. The first time, a phoner for The Syracuse Orangemen, I told him I had forty questions. “Chose your favorite,” he said making lunch plans under his breath. The second time, he offered me an America Spirit in Warner Bros. NYC HQ. I turned green, but held it together through the MTV Q&A (“Michael Stipe: Man On The Moon”). And a Fireglo Rickenbacker 360 — best appreciated (perhaps) on 2005’s “Heartland” LP — was my first electric guitar. I still have it (albeit under the bed). The band’s tastes shaped mine. Through interviews (which I clipped and collected in a manila folder labeled “The REM Files”), collaborations and co-signs, I discovered innumerable artists, from The Velvet Underground to Flat Duo Jets, Chris Isaak to Lester Bangs, The Replacements, Wire, Mission Of Burma, Guadalcanal Diary, The dBs, and many, many more. I covered them live thousands of times, from my first-ever live performance at Conestoga High School (“Finest Worksong”) to our frequent, attic-shaking college keggers (“It’s The End Of The World As We Know It (And I Feel Fine)”, of course), to Arlene Grocery (“Second Guessing”), Mercury Lounge a few days after September 11 (“World Leader Pretend” dedicated to then-President George Bush) and Rockwood Music Hall last year (where I tacked a verse of “I Believe” to the top of “St. Anne (Of The Silence)”). In fact, it was Jamie, Paul and my rough but passable run through “Driver 8” in a dusty living room on Standart Street in Syracuse that birthed Smokey Junglefrog — and the rock ‘n roll fantasy (or delusion, depending) that followed. Moreover, though, R.E.M. helped shape an aesthetic: call it expressive, art-house, minor-chord pop. It was a little darker, a little obscured, a little esoteric, but accessible. It was implicit, evocative. You had to work for it, connect the dots, parse the meaning. It’s evident from the cover of Smokey Junglefrog’s 1990 LP “Crumble” (a blurry, wiry light bulb) to 2011’s “Forever Young” (a blurry, bucolic close up of my infant daughter). 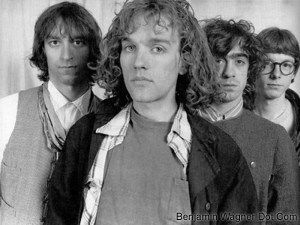 More than influences, introductions and aesthetics, though, R.E.M. invited me into music. Before that iconic, eyeliner-smeared performance, I was just a fan. Standing there on my seat in the second row, enveloped in the sound, light and fury, I was hooked. I joined a band months later, went to college, bought a guitar, and set out to record my “Murmur,” and live my own sometimes esoteric, always expressive, art-house, minor-chord but mainstream pop life. I’ve followed my pal Casey Shea every step of the way. From his early NYC days straight off the express bus from Music City, to his oversized, undefeated Undisputed Heavyweights shows, to his understated, overwhelmingly-beautiful Sundown. I’ve roped him into all four “A Holiday Benefit records (our fifth and final effort bows December 14th at Rockwood Music Hall II), my “Forever Young” benefit LP (in which his angelic vocals float like billowing clouds above “Golden Slumbers”), and even the soundtrack to my documentary “Mister Rogers & Me” (in which Mr. Shea’s “Love Is Here To Stay” plays a crucial role). Casey’s a friend. I’m a fan. And now this, his most-sonically confident and lyrically confessional record yet, “In Your Head”: stadium-sized, radio-friendly and more-than ready for primetime. Benjamin Wagner: The record sounds lush, deep, and rock solid. Where did you track? With whom? Solo songwriting? With the band? Collaborators? Casey Shea: We started recording with Chris Cubeta at Galuminum Foil last May. The good thing was that I was just about to release “Love is Here To Stay,” so there was no real rush. I had the luxury of recording and letting it sit for a couple of months and coming back with fresh ears at the beginning of this year. By then, there were a couple of new songs, and I thought they’d be good fits for the album. My bass player, Matt Basile, had just done some recording with MotherFeather at Metrosonic and had a good experience cutting live tracks, so we did a few tracks there. For the most part, the tracking was done with the guys I had been playing with for a couple of years. Matt Basile on bass, Gilber Gilmore on guitar, Nicholas Webber on piano. Drums were done by three different guys, Aaron Steele, Sarab Singh, and Josh Dion. There was a rotating cast of characters including Tony Maceli, Chris Cubeta, Wes Hutchinson, Bryan Trenis and Len Monachello (who now plays keys in the band) who came in to fill in bits and bobs all over. So yeah, I surrounded myself with a lot of great players! Songs came from everywhere. Some solo, some co-writes with various friends/bandmates, and one written entirely by Matt Basile. I had a ton of songs, but these were (in my opinion) the best. BW: What did each of you (you, band, producer) bring to the production in terms of source, inspiration, ideas? CS: The band had been playing and rehearsing a ton all throughout last year, and that’s where the arrangements really stemmed from. I usually came in with a song or something I was working on, and we’d mess around with it. It’s great working with people you trust and respect, cause you can bring in a song, just let go a bit, and end up with something completely new and fresh. arrangements. He’s a great musician and songwriter, and all around good guy, so it was nice to have someone like him to work with. BW: Explain the confidence to you and your band’s performance. You’re solid as a rock. “In Your Head” is Madison Square Garden-sized. CS: Well I’m glad that comes across. I think a lot of it comes from just playing a lot over the past couple of years and all being at a point where we were ready to go into the studio and DESTROY! Ha! 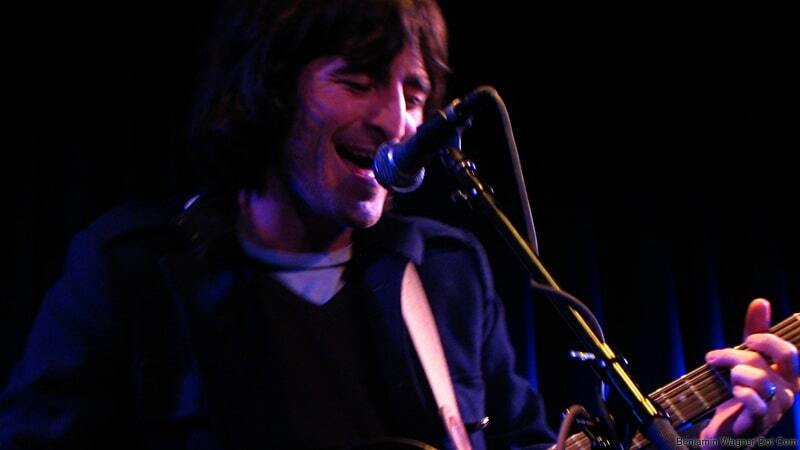 BW: You played dozens of solo acoustic shows in the US and UK in the last few months. What, if any, bearing did that time have on you? Your music? The album? CS: I guess the big thing about those tours was that they were just me and a guitar… nothing to hide behind, completely exposed. In a way it was very freeing, cause I could do anything. Play whatever song I wanted, stop in the middle of a song, make jokes, whatever. Also, I think playing in the band with such good musicians over the past few years made me a much better musician. Not that I consider myself much of a guitarist, but it had been a long time since I did the solo thing, and I had a comfort on stage throughout these tours that I did not have a few years ago. BW: The album title says a lot, but your lyrics sound pensive (“Tossin and turnin”), thoughtful, maybe a little bit torn. What’s going on in your head? On those drives (“Gotta clear my mind”)? 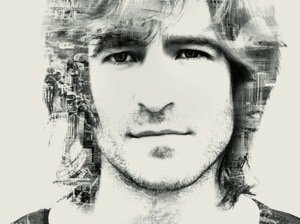 CS: The writing of a lot of the songs on this album happened during a very uncertain period of my life. I had another band that had a very typical band/major label experience (wherein major label puts band into indefinite holding pattern). I came out of that not knowing what I was doing or what I was going to do with my life. There were a lot of sleepless nights, a lot of thinking, and a lot of doubt. BW: I think that “getting out of one’s head” is the human condition, really, the dynamic that drives everything from yoga to heroine to rock ‘n roll. What’s in yours? What do you want out? What do you do to get there (or get away from there)? CS: I’d probably say it’s the reason I write songs and create art. I am constantly searching for the deeper meaning of all of this. There is definitely something amazing and liberating about being on stage, but nothing is as meaningful as creating a piece of art that is timeless, that you’re proud of, and has the ability to touch other people. BW: What’s next for the album? What’s the five year plan? Ten? CS: We just released the album this week. We’ll keep pushing it out to anyone and everyone, and hopefully those people will like it enough to share it with their friends. We’ve got two videos in the works, so I’m really excited about that, and hopefully we’ll do some more touring this Winter and Spring to continue getting the word out. As for 5 and 10 year plans, my goal is to be happy and make a decent enough living to support a family by making the kind of music I love. Is that so much to ask!? !